In a world looking for a new reason to outrage every day, it surprises me that Vishal Shekhar’s ode to “Punjabiyan di booty-shooty”, Tooh, hasn’t drawn any flak yet. Not that I want anyone to either, it is a fun song and people would do well to consider it just that. The arrangement features all the wedding dance paraphernalia – brass, synth, dhol et al. And Mika Singh, Mamta Sharma and Shruti Pathak on vocals do a spirited job too. Having Shankar Mahadevan is almost always a plus to a song; Chingam Chabake too the man embellishes with his trademark flourishes (watch out for that sargam he sings with the harmonium hook). He is given super support by Shalmali Kholgade. The song though has nothing particularly fresh to offer, but for some interesting segments in between (like that second interlude). The remix gives more prominence to that short sargam from Shankar, but is otherwise regular. From youtube videos to Coke Studio at MTV, Sanam Puri finally takes that big leap into film music with Dhat Teri Ki and does a fine job of it, with Aditi Singh Sharma by his side. The song carries a definite V+S hangover about it, but the retro dance music flavor grows on you. Not so with the redundant remix though. Another youtube star debuting in Bollywood with this movie is Sanah Moidutty, alongside Sukhwinder Singh in the Gujarati-Hindi Moto Ghotalo (funnily reminded me of Mylo Xyloto, the name!) Fun song, but in a very Kashmir Main Tu Kanyakumari way, and that is the song’s bane. Good singing though. Naina is the singers’ show through and through – Kamaal Khan, who rejoins Vishal-Shekhar after long break, and Neeti Mohan – delivering the folk-flavored tune to splendid effect. Dil Duffer is the soundtrack’s best, the composers building on an immensely likeable tune with a spunky arrangement. Nitesh Kadam and Shruti Pathak complete the set with a spotless singing effort. 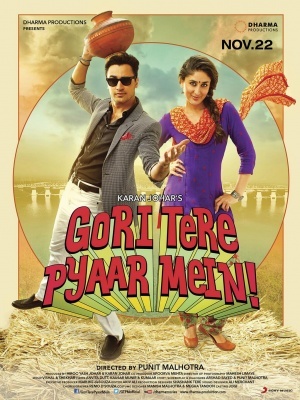 Finally there is a Gori Tere Pyaar Mein Mashup by Kiran Kamath. Much weaker than his past mashups. Gori Tere Pyaar Mein. One of Vishal Shekhar’s better soundtracks in 2013. That said, the duo is yet to hit that sweet spot this year. Strange, given that Shekhar has had three lovely singles elsewhere. Just posting it. Was busy over the week with work. aren’t you gonna review dhoom 3 album?